It takes more than thunder, lighting and rain to keep the Chelsea Robotics community from having fun at their 1st Annual Community Picnic. Moved to the Beach Middle School cafeteria, the FTC students set up their new field and started up their competition robots for everybody to drive and experience. Everybody from the youngest sibling and to the parents alike all had a chance to drive and experience the fun of robot operation. There was much dancing, games and good natured, robotics themed fun! FLL Coach Dan Welling cooked amazing BBQ for everybody and Ky Welling prepared a delicious robotics inspired cake (Nothing less would be expected by the Coach and family of the FLL Cakensteins). Families all shared and brought food, everybody was well fed and content. The Chelsea Robotics Boosters celebrated our Young Engineers and acknowledged their advancement from one league to the next. We had several FRC High School Students present who are graduating and we cheered them on to great things and thanked them for their years of Robotics in our community. The Boosters also saluted our amazing Coaches and Mentors for their stalwart support of our Young Engineers. We look forward to our next Robotics Picnic where we plan on even more fun, more robots and a larger community to celebrate with. Thank you for everybody that have helped make this last year a success and helped us celebrate it at our first Annual Robotics Picnic. Last night, on January 10th, the Cakensteins had a short reunion at the FLL Jr End-of-Season Expo. 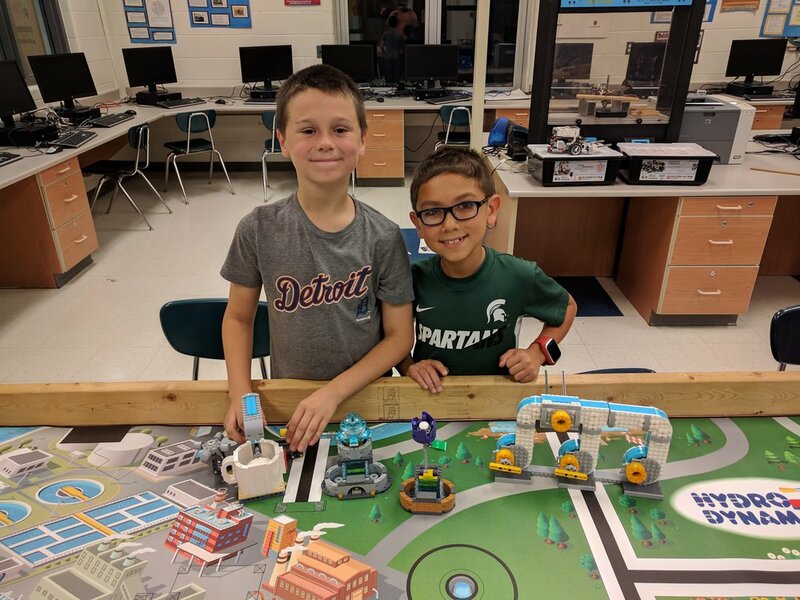 The young engineers showed off their accomplishments by displaying their competitive robot and explaining the research they did for the project. It was a great way to relive the FLL excitement and share their experiences with the next generation of young engineers. The FLL Jr students loved learning about the opportunities awaiting them at the next level. The team rolls the robot to the field for their last match of 2017. On November 18th, the Cakensteins competed in the Downriver Robot Rescue in Allen Park, Michigan. The all-day event included a project presentation, a core values interview, an engineering review, and, of course, the robot game. The team ran the robot game four times, scoring in the upper half of the 20+ team event. The young engineers performed admirably, showing great bravery every time they walked into the competition rooms. Though they were all rookies, they showed poise and savvy at every phase. They handled on-field robot difficulties like pros. They also exemplified all of the core values throughout the day, including Coopertition and Gracious Professionalism. All of the coaches and parents were extremely proud of their work. In the end, the team walked away without trophies or adornment. However, they did not leave empty handed. The young engineers remain highly energized and motivated to earn awards next season. See you next year, Cakensteins! The first part of the FLL competition is the robot game. During this game, we have 2 and 1/2 minutes to launch our autonomous (i.e., moving by itself!) robot and have it complete as many missions (pre-defined tasks) as possible. You can read more about the tasks here. We've made huge progress with our robot and have achieved our first successful attempts at scoring points. Our robot can now perform the "filter" mission and the "broken pipe" mission. This would earn us 50 points on game day. Check out the video below to see our design in action. We are currently working completing more missions, including the fountain and the water treatment missions. The young engineers have been designing, building, and coding our robot diligently! We are now entering "the grind" portion of our season. The last two practices wrapped up our introductory period of the season. We have finished constructing the play area and have moved on to starting to build a functional robot. Our Saturday practices start this weekend, marking the beginning of our in-depth builds and programming sessions. We'll be busy until our competition at the end of the season! Our young engineers will soon be uploading their own movies and photos from practices in this space. Be sure to watch this space for new, student-driven content! Our goal this week was to start assembling the play area for the robot game. This is a 4'x8' mat with a series of Lego obstacles. By the end of the season, our robot will be able to navigate through and around the obstacles while we lift, turn, push, drop, and place objects to score points. Our Young Engineers split into teams of two and started building the obstacles. Keep in mind that the whole challenge set contains more than 4000 Lego parts. Next week, we'll finish building, then we'll unroll the mat and put all of the pieces in place. For the first time, we'll be able to start thinking about the strategy our robot will take as it moves across the field. A special thanks to our parent mentors who have been donating snacks and helping out at practice! We Need You, Human Parents! Just a reminder that we're looking for volunteers and many different levels. For each evening practice, we need parents to donate snacks and attend to be parent mentors. Being a parent mentor for one (or more!) of our practices is a great way to see what our young engineers are up to and help the team get prepared for competition. Click here to access our Sign-Up Genius form to volunteer. We also need coaches and representatives for the Chelsea Robotics Boosters. Full coaches will work with the team throughout the season. 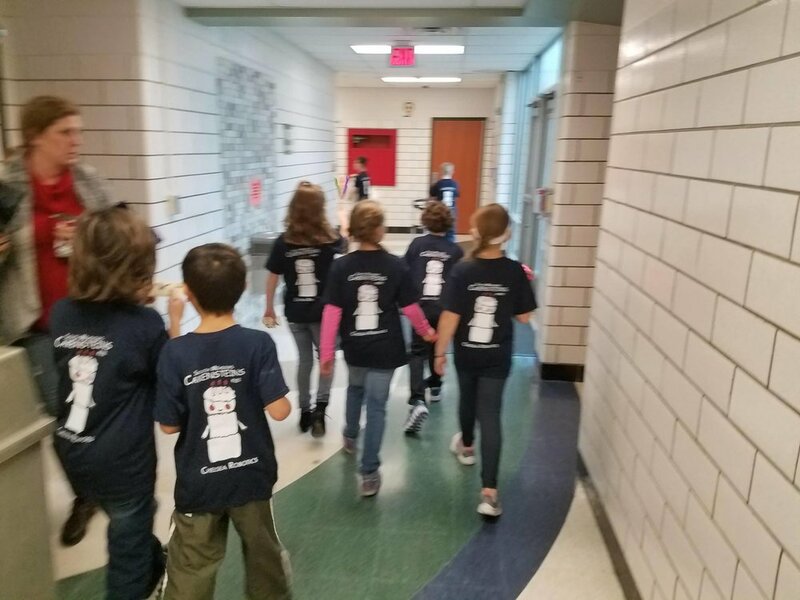 CRB representatives will attend the monthly booster meetings to help guide the growth of the South Meadows team and the whole Chelsea Robotics community. FLL Kick off Meeting, Go Go Cakensteins! 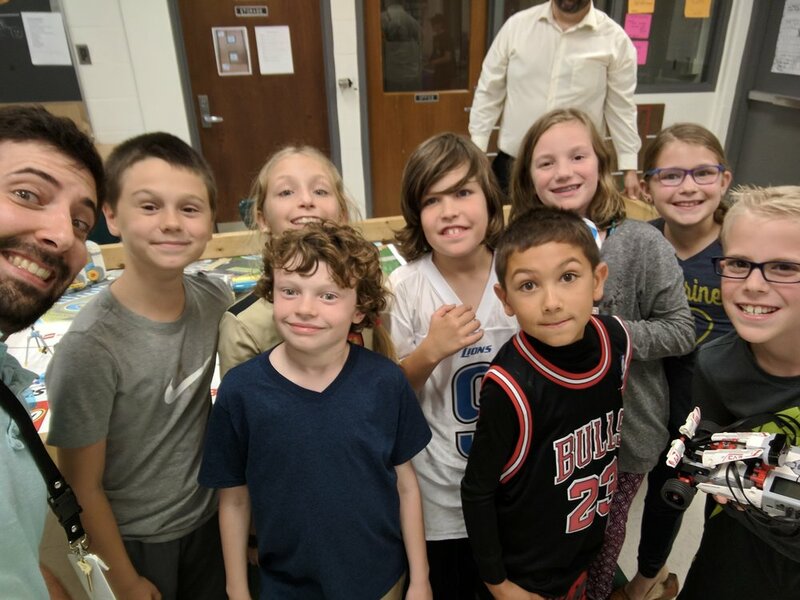 Coach Dan and the Young Engineers of the new FLL Cakensteins met for their first team meeting. Much fun was had, legos built, team bonding and the season challenge revealed. 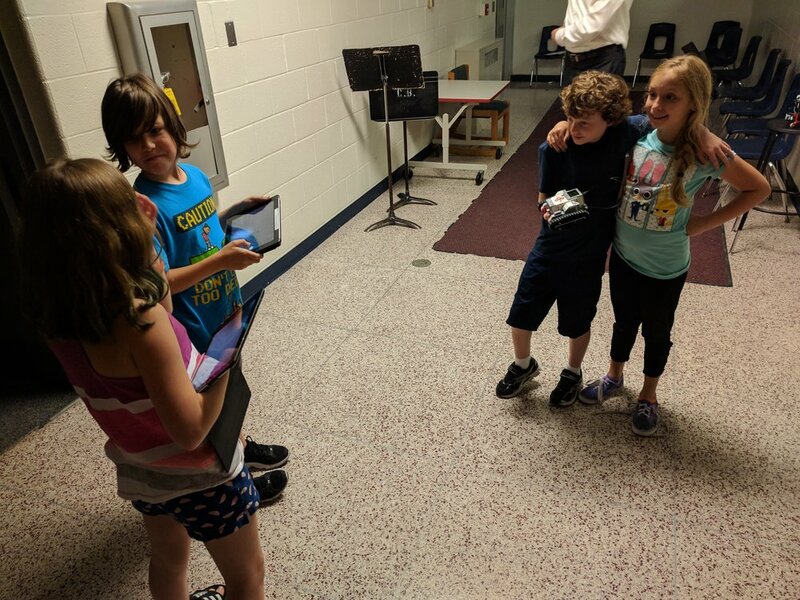 Today, we had our first practice of the FLL season. The first thing we did was read and discuss the FIRST Core Values. The core values guide our behavior and attitude throughout the semester. It starts with recognizing that we are a team, emphasizes Gracious Professionalism and Coopertition, then closes by reminding us that we have fun! All of our Young Engineers received a list of the core values, but parents should have a look at them too! Next, we started with a Lego build challenge. We broke into teams and tried to combine any 20 parts together such that they could withstand a 4-foot drop without breaking. We wrote down our designs and noted what went wrong and what went right. We then split into different teams and took what we learned to the next level - literally, by dropping our designs from 6 feet. Next, we opened our challenge kit. This is the kit that contains the Robot Game playing field and over 2000 lego parts that make up the obstacles. The team finally saw the scope of the challenge they must tackle over the rest of the season. Finally, we spent some time learning about our team name: the Cakensteins! The 2017 challenge has finally been released! This is the description of the robot game and project topic that will be the focus of the team for the entire semester. The Robot Game happens on a 4'x8' game field. The robot must autonomously complete a set of tasks related to this year's theme: hydrodynamics. The tasks include placing pipes, turning on sources of "water", etc. Our team will be learning how to build and program a Lego robot to complete these tasks! Each task yields a set of points. The students must strategize which tasks they will focus on to get the highest score! 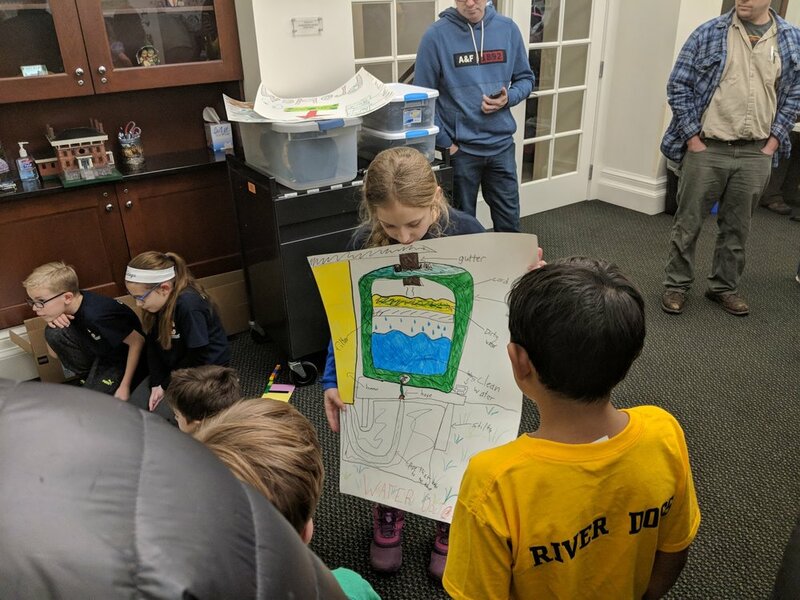 The Project requires the students to identify a real-world problem related to hydrodynamics, design a solution that they think will overcome this problem, and then share their solution. The hydrodynamics project is the second focus of the team throughout the season. The South Meadows teams will participate in the robot game and project presentation in an official tournament at the end of the season. Now that the challenge has been released, we know what our goals are! 2017 Season Teaser has Landed! The new season teaser has landed for FLL and it's so exciting. What do you think it means?